Digi-Schlock: HORROR EXPRESS (Severin Blu-Ray/DVD Combo Pack) – Schlockmania! It’s hard for a bargain-bin perennial to catch an even break in the home video marketplace. Even classics like Night Of The Living Dead and Messiah Of Evil have had to endure endless cheap-o grey market discs with varying versions of the same fuzzy video source. Horror Express is another title that has suffered such treatment for decades: despite a good-for-the-time disc from Image Entertainment back in the 1990’s, this title has most suffered from shoddy releases over the years. 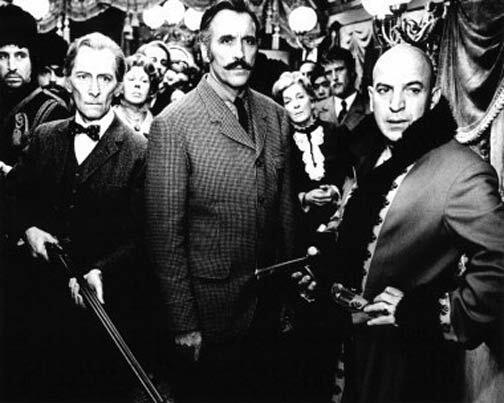 Thus, it’s a pleasure to note that Horror Express has finally gotten a worthwhile upgrade from Severin Films – and it also happens to be a blu-ray/DVD combo pack. Both discs feature a new transfer taken from the original Spanish elements: outside of some debris on the opening credits (always a problem with this film), the results are astonishingly crisp and clear. The velvety color schemes of the train interiors have a surprising richness to them and the end results look great. Both English and Spanish soundtracks are provided, with subtitles for the latter. At this point, it should be mentioned that there have been complaints in some quarters about this set because the blu-ray doesn’t maximize its bit rate, nor does it have a lossless audio track. While that is an unfortunate oversight, it in no way reflects poorly on the quality of Severin’s transfer. The blu-ray is a quantum leap in quality over the film’s previous video incarnations – and the lack of a lossless track really isn’t that big an issue here as the sound is limited to vintage mono mixes. To reject this release for not having all the high-tech bells and whistles is an exercise in pointless fanboy purism. This set also improves on past versions of Horror Express by adding plenty of extras. In lieu of a commentary track, this disc offers up a nearly 80-minute interview session that Peter Cushing did with a live audience in 1973. Cushing was legendary for being one of the true class acts of the horror business and he lives up to that reputation here. This expansive chat covers the gamut of his career, from his beginnings as a stage actor and working with James Whale to his ultimate destiny as an icon of horror fandom. He tells plenty of good stories, discussing his then current favorites (The Poseidon Adventure), why he didn’t like Psycho and even offering a fond appraisal of his favorite director, Terence Fisher. Any fan of classic horror will enjoy his informative and always gentlemanly comments. There is also a suite of featurettes that cover the film and related matters that will be of interest to fans. It all begins with a video introduction from Fangoria editor Chris Alexander, who applies a charmingly motor-mouthed style to this piece as he lays out why it’s such a special cult favorite. This is followed by a 13-minute interview with director Eugenio Martin. He covers a bracing amount of material in a short time: topics include how the project grew out of producer Philip Yordan’s desire to reuse the train sets from Pancho Villa, the differing acting styles of Cushing/Lee and Savalas and the different effects challenges. His commentary is smart but likeably humble. The most unique inclusion in the featurette area is a half-hour interview with co-writer Bernard Gordon. 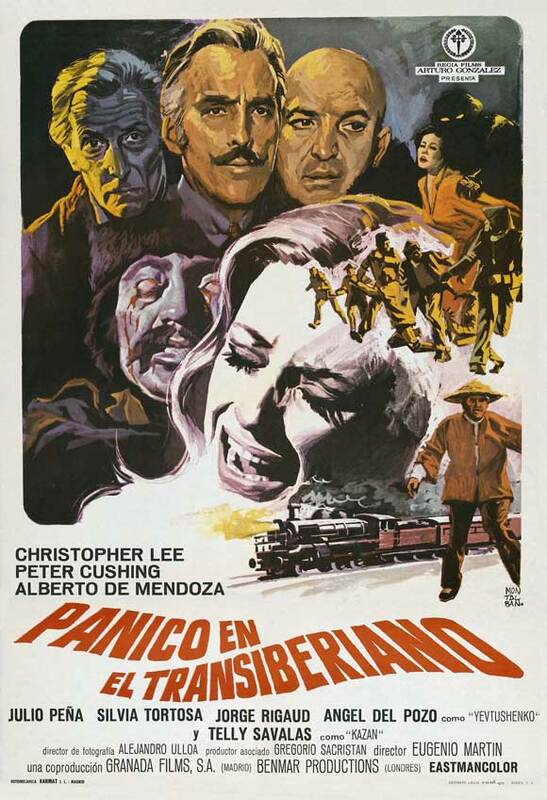 This was filmed for a different, as-yet-unreleased DVD so it doesn’t say anything about Horror Express but it’s pretty fascinating stuff on its own terms. Gordon tells the tale of how he worked in Hollywood during the 1940’s as a writer, began working under assumed names after being blacklisted and ultimately ended up in Spain working on Samuel Bronston’s “runaway” American/European epic productions. It’s fascinating to hear how Gordon dealt with the stigma of the blacklist and he also tells great stories about big stars from the Bronston productions like Charlton Heston, David Niven and Ava Gardner. It’s well worth the time for any serious film buff. The final featurette is an interview with composer John Cacavas. Surprisingly, the focus here isn’t the music as much as it is his friendship and collaboration with star Telly Savalas. He talks about how they built a friendship and musical partnership that continued until Savalas’ death, including stories of working on Savalas’ musical albums (the star had a surprisingly successful run as an MOR pop singer, with Cacavas doing the arrangements). It’s the kind of interesting showbiz story that you don’t often hear on a genre release and it’s nice that the disc’s producers have preserved it for posterity here. The package is rounded by a theatrical trailer for the film and a trio of trailers for other Severin titles. The latter set includes the not-yet-released The House That Dripped Blood so hopefully that means a disc for this title is on the way. In short, this a fine disc for a deserving genre favorite. Whatever quibbles one might have about the technical end of things, it remains a solid package that offers good value for the money and a significant improvement on past editions. If you love Horror Express, don’t hesitate to check this set out.